It’s finally time for cooling salads once again. Not that I ever really stopped making salads, per se…but the veggies are fresh, the farmer’s markets are open, and the temps are sweat-inducing. I like it. I like it a lot. Seaweed, or sea vegetables as they are more endearingly called, are filled with antioxidants, calcium, and vitamins (see here for more detailed nutrition information). They are also a fantastic source of umami, the elusive fifth taste that many vegans and vegetarians crave due to its noticeable absence from plant-based foods. Umami can be described as “savoriness” and is often found in meat, eggs, and cheese, although vegans can find it in sundried tomatoes, mushrooms, soy foods, and nutritional yeast. I know that if a bit too much time passes without eating such mouth-watering foods, I’ll get to craving umami, and find myself standing at the counter eating spoonfuls of powdery nutritional yeast, and yes, actually enjoying do so. To avoid such umami breaking points, I’ve been adding a seaweed called kombu to my weekly pot of beans to coax the legumes into being easily digested, but also to lend a bit of that “oomph” that I lust after from time to time. 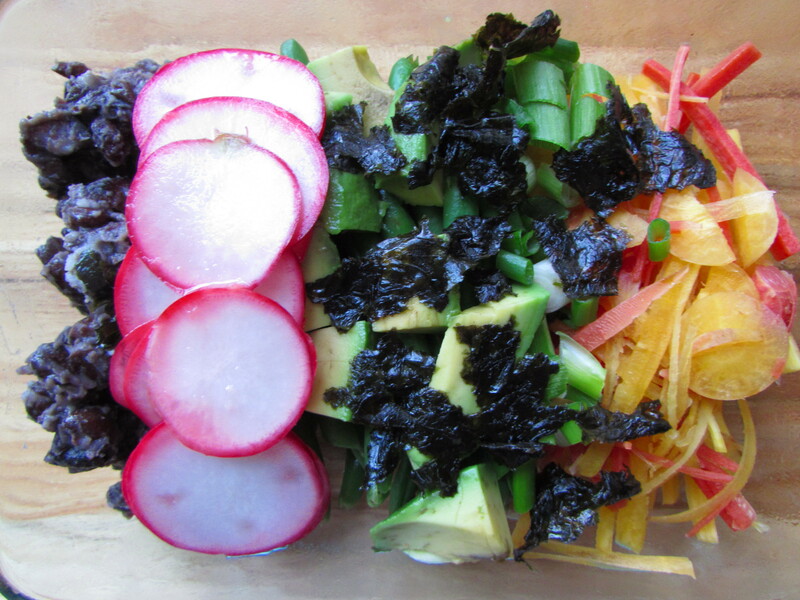 This Rainbow Sushi Salad contains many of my favorite veggie sushi ingredients: nori, julienned carrots and avocado, along with some friendly new faces: sliced snap peas, green onions, black beans, and ginger-pickled radishes. Right before eating, I pour on a tbsp or so of light soy sauce. Mmm, mmm, mmm. 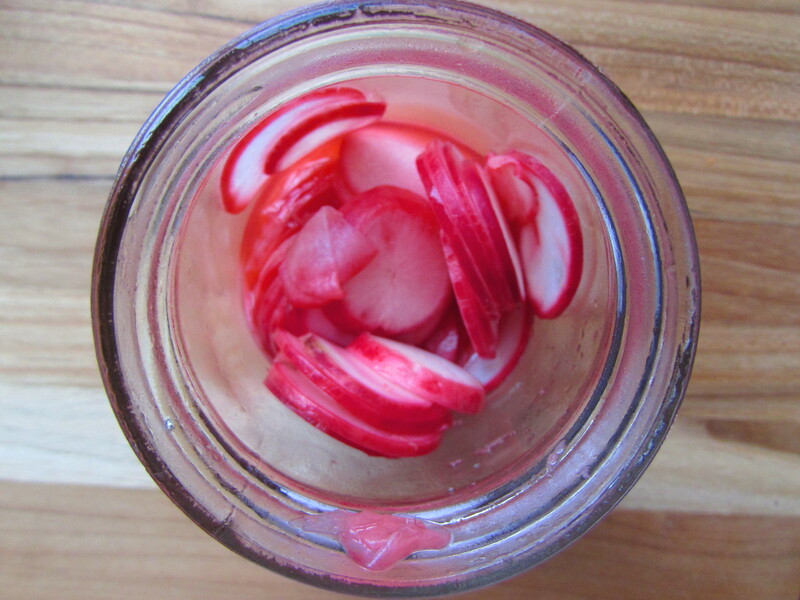 The ginger-pickled radishes are a breeze to make and last for at least a week tucked away in the fridge. I peeled off the lid of this during lunch and a coworker said to me: “Wow! 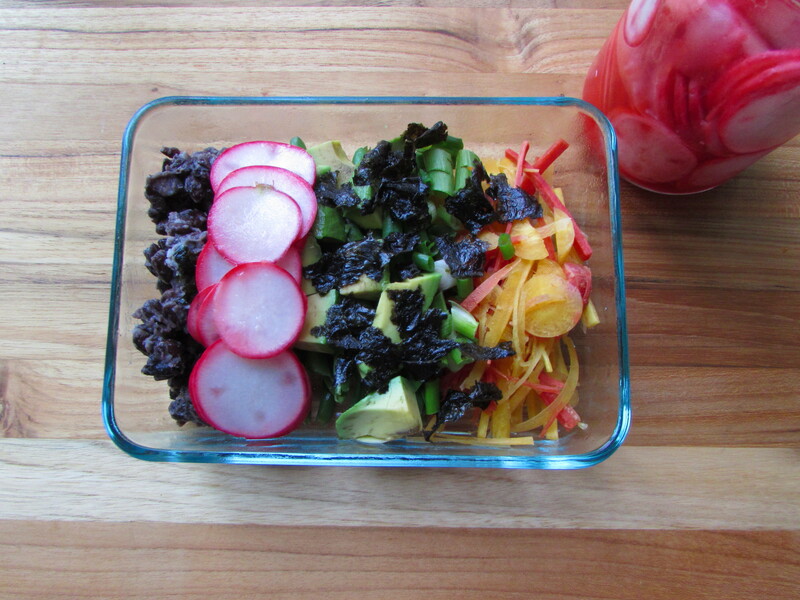 That looks just like a rainbow”, so the Rainbow Sushi Salad name was born. I think this meal could also be adapted to be a bit heartier by having a base of cooked short-grain brown rice. Happy sushi-ing! Line up beans, snap peas, and carrots along the bottom of the container. Place radish slices, avocado, and spring onion on top. Sprinkle with seaweed. When ready to eat, drizzle on a tbsp or so of soy sauce on each serving. Enjoy! Slice the radishes very, very thinly. You should be able to easily bend the slices, or even see through them. I used a mandolin to accomplish this, but careful knife skills should have a similar effect. In the bottom of a 12 or 16 oz jar, mix together the rest of the ingredients. Put in the radishes. 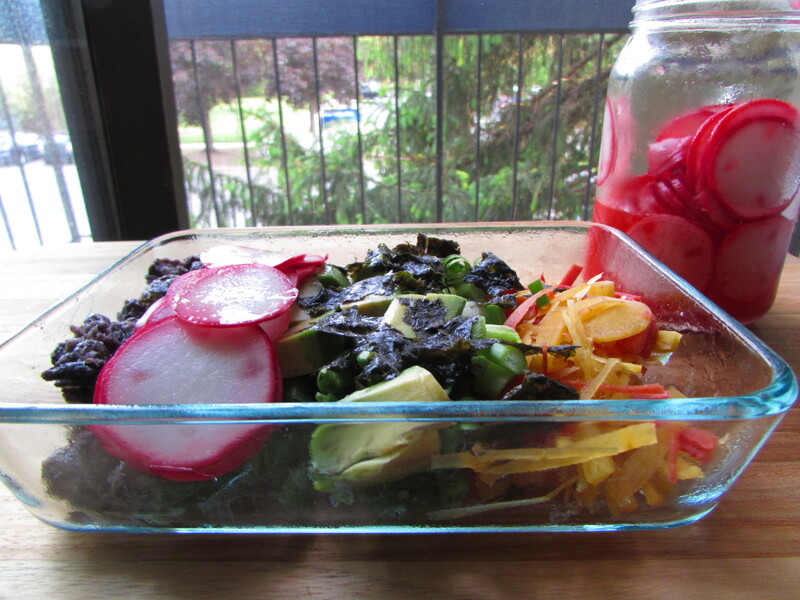 Screw on the lid tightly and shake the jar vigorously to cover the radishes with the brine. Let sit in the fridge for 20 mins. Devour their crunchy goodness. They will keep a week or two in the fridge, if they last that long. These radishes are great on everything from salads, to sandwiches, to a nice soup or risotto garnish. Or, if you’re like me, you’ll just eat them straight out of the jar for a little snacky.